BISMARCK, N.D. - North Dakota had the biggest drop in the country's child-poverty rate, but child well-being experts say there's more work to do, especially for Native families. The census data shows North Dakota saw a 20-percent drop in the state's child-poverty rate from 2011 to 2015. Experts point to the state's low unemployment rate and recent oil boom as reasons behind the drop, but that number continues to be higher than before the recession in 2008. And Karen Olson, the program director with North Dakota Kids Count said the statewide numbers can mask the disproportionately high rates of unemployment and poverty among the local Native American population. "Our youth within our tribal nations are five times more likely to be impoverished than children living elsewhere in North Dakota," she said. "So, there are some challenges, there are some struggles that we need to be focused on." Olson suggested the state could help close the gap in those disparities by making more investments or expanding early-childhood home visiting programs, which she said can help prevent child abuse and neglect and increase educational opportunities. Nationally, unemployment has continued to decline since the recession. But Laura Speer, the associate director of policy reform and advocacy with the Annie E. Casey Foundation expects that the child poverty rate would also improve faster, because both rates typically track close together. "It's taken awhile for the child poverty rate to really make any headway, and in fact, we're still higher today at 21 percent than we were in 2008 when the child poverty rate was 18 percent," she said. According to new research from North Dakota Kids Count, the state's child population is growing faster than any other state in the country. Olson said that's one more reason to expand on existing programs aimed at helping families. "Programs like Head Start that address both the needs of the child and the parent by increasing school readiness among young children, with the assumption that a healthy home will continuously benefit children throughout their development," she added. Wells Fargo's scandalous practice of secretly opening more than 2 million sham deposit and credit card accounts dragged on for at least five years. How did Wells Fargo get away with it for so long? A big part of the story: Wells Fargo contract provisions blocked consumers from suing the bank in court. It's past time to prohibit the "ripoff clauses" that prevent consumers from enforcing their most basic legal rights. Like most big banks and many other corporations, Wells Fargo buries ripoff clauses in the fine print of its customer contracts. These provisions, also known as "forced arbitration" clauses, prevent consumers from suing over wrongdoing in court and prohibit consumers from banding together in class actions. Instead, ripoff clauses force consumers to seek redress in private arbitration, on an individual basis. So when lots of consumers have suffered small harms — as was the case with Wells Fargo — there's nothing they can do. It's generally not worth the time and money to bring a case individually, and there's a disincentive to proceed in arbitration, where claims are decided by a private firm handpicked and paid by the corporation rather than a judge or jury. Effectively, banks and other corporations are free to rip off their consumers without fear of being held accountable in court. The problem isn't just that aggrieved consumers don't have access to a remedy. Keeping cases out of court means abuses are kept out of the spotlight. That's exactly what happened with Wells Fargo, and why the abuses could go on so long. Indeed, more than three years ago, a Wells Fargo customer named David Douglas sued in California, contending that the bank's employees and branch managers "routinely use the account information, date of birth, and Social Security and taxpayer identification numbers ... and existing bank customers' money to open additional accounts." Douglas alleged that branch managers opened at least eight accounts in his name and created fake business accounts under his name without his knowledge. This case should have gone to court but was blocked by a ripoff clause. Douglas's lawyers argued that an arbitration provision in a legitimate account agreement should not bar him from suing over a sham account he never agreed to open. However, citing recent 5-4 U.S. Supreme Court decisions, the judge held that the ripoff clause in the original agreement blocked him from suing Wells Fargo. In 2015, another Wells Fargo customer, Shahriar Jabbari, tried to file a class action against the bank, claiming that employees hid fees, refused to close accounts on request, and forged signatures and addresses. Wells Fargo publicly denied these allegations. Again, the judge ruled that the ripoff clause in the original account agreement forced any unresolved disagreement into arbitration, and Jabbari's class action was kicked out of court. Had these early cases been allowed to proceed, others almost certainly would have followed, and Wells Fargo may have ended these pervasive abuses years ago. Instead, it took until last week for the practices to be halted, and then only thanks to the efforts of the new Consumer Financial Protection Bureau (CFPB), the agency devised by Sen. Elizabeth Warren (D-Mass.) and adopted as part of the 2010 Dodd-Frank financial reform bill. State and federal regulators had notice of the problem at least as far back as 2013, when the Los Angeles Times first reported on Wells Fargo's fraudulent accounts. Front-line Wells Fargo workers had drawn attention to the problem, too; in April 2015, at the bank's annual shareholder meeting, Wells Fargo employees with the Committee for Better Banks submitted an 11,000-signature petition calling for an end to sales quotas that fueled fraud. Private enforcement – individual lawsuits and class actions brought by harmed consumers — not only is a necessary complement to agency efforts, but it also often alerts agencies to the need for action. Governmental agencies don't have the resources to police every instance of fraud. And these agencies frequently face industry smears and congressional posturing that halts or slows their ability to act. When consumers are blocked from suing, it takes longer for agencies to become aware of a problem and is much more difficult for them to gather evidence and build a case — particularly when companies use forced arbitration to keep victims silent. The solution: Do away with ripoff clauses. The CFPB has proposed a rule that would end the worst ripoff clauses in the financial arena, restoring consumers' right to join together in class actions to hold banks accountable for predatory behavior. The big banks are trying to block the rule, but the Wells Fargo scandal shows exactly why the CFPB should prevail. Weissman is president of Public Citizen. Donner is executive director of Americans for Financial Reform. BISMARCK, N.D. - For many members of the Lakota Sioux Tribe, the battle against the Dakota Access Pipeline is just the latest symptom of a longstanding racial divide in North Dakota. Native Americans in the state are jailed and live in poverty at much higher rates than their white neighbors, and some tribe members say North Dakota's strict voter ID laws keep them disconnected from state government. Earlier this month, anger over these and other issues came to a head when Native protesters were met by security guards with dogs and pepper spray. Days later, Gov. Jack Dalrymple called out the National Guard. Phyllis Young, a former tribal councilwoman for the Standing Rock Sioux, said she isn't surprised by the extreme response to the protests. "We've run on empty for a number of generations and we're stepping up," she said. "We have reached a pinnacle and a peak." Young and other tribal members were interviewed for a YES! Magazine article, which detailed how state policies and social barriers have led to persistent poverty among North Dakota tribes. National attention on the Dakota Access Pipeline protest has earned support from Hollywood celebrities, activists and other tribes across the country. But Chase Iron Eyes with the Standing Rock Sioux said local policies are to blame for some of the local tribes' frustration, including a state voter ID law that requires a physical address. "I never had a physical address until, I don't know, until I came back from law school," he said. "Our whole lives, we have P.O. boxes, and so this was something that, in the law, what we do have is a discriminatory impact." The Obama administration recently put the Dakota Access project on hold in sacred tribal areas while the Sioux Tribe's lawsuit over the pipeline is in federal court. Even if the pipeline is defeated, Lakota spiritual Chief Arvol Looking Horse said he believes more must be done to address the disparities among Native populations. "The fear of racism, it's alive and well in the Dakotas. Today, it's even gotten worse because of the political leaders," he said. "People of the world don't even know that we exist today. And finally, this is the whole world watching." This story was produced with reporting from Jenni Monet for Yes! Magazine. Monet is an award-winning journalist and member of the Pueblo of Laguna in New Mexico. She's also executive producer and host of the podcast Still Here, launching this month. 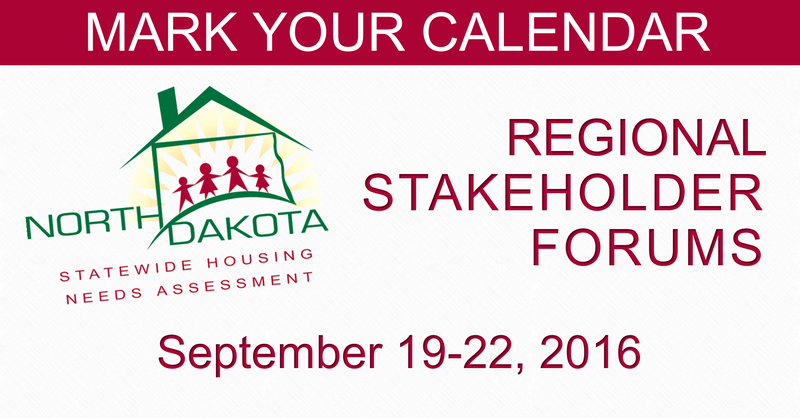 BISMARCK, ND – In conjunction with the release of the 2016 Statewide Housing Needs Assessment, North Dakota Housing Finance Agency is hosting regional stakeholder forums across the state to allow community leaders and members of the public to learn more about projected housing needs in their area. An analysis of the state’s current and future housing needs, the Assessment is available online at www.ndhfa.org. It was conducted by the Center for Social Research and the Department of Agribusiness and Applied Economics at North Dakota State University. The regional forums will feature a presentation by Assessment author Dr. Nancy Hodur as well as a discussion of housing needs and priorities specific to each region. Community leaders, business people, housing stakeholders and the general public are invited to provide their input at these meetings. Tri-County Region I – Sept. 19 at 10 a.m., Williston Center for Development, Planning and Zoning Conference Room (2nd floor), 113 4th St East, Williston, ND. Roosevelt-Custer Region VIII – Sept. 19 at 3 p.m., Dickinson Public Library, Community Room, 139 West 3rd St, Dickinson, ND. Souris Basin Region II – Sept. 20 at 10 a.m., Minot Public Library, North Room, 516 2nd Ave SW, Minot, ND. North Central Region III – Sept. 20 at 3 p.m., Lake Region State College, Chautauqua Room, 1801 College Dr N, Devils Lake, ND. Red River Region IIII – Sept. 21 at 10 a.m., Grand Forks Herald, Community Room (Alley Entrance), 375 2nd Ave N, Grand Forks, ND. Lake Agassiz Region V – Sept. 21 at 3 p.m., Fargo Public Library Community Room, 102 N 3rd St, Fargo, ND. South Central Region VI – Sept. 22 at 10 a.m., Jamestown/Stutsman County Development Corp., 120 2nd St SE, Jamestown, ND. Lewis & Clark Region VII – Sept. 22 at 3 p.m., State Capitol, Pioneer Room, 600 E Boulevard Ave, Bismarck, ND. Assessment components include a statewide population and housing forecast, regional profiles and detailed tables broken down by various levels of geography including the state as a whole, the eight planning regions, 53 counties, 12 major cities and four Native American Indian Reservations. An additional study component that examines several special topics such as recent trends in housing costs and special populations will be released in September. NDHFA is a self-supporting state agency dedicated to making housing affordable for all North Dakotans. The North Dakota Industrial Commission, consisting of Governor Jack Dalrymple as chairman, Attorney General Wayne Stenehjem and Agriculture Commissioner Doug Goehring, oversees the agency. NDSU’s Center for Social Research is an applied social science research unit dedicated to providing a venue through which a wide variety of research activities are facilitated. Hodur is the Center’s Director and has over 25 years of professional experience in applied research, public policy and outreach education.